With relatively cool, short growing seasons, the Pacific Northwest is a challenging place to grow tomatoes. When we get a particularly wet and cool spring and summer, as we have the past two years, it gets even trickier. Yet tomatoes are a wildly popular fruit, and are by far the most-requested crop we grow for our clients. 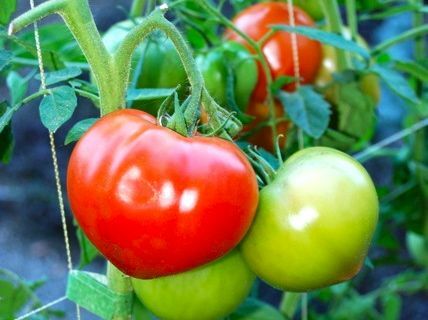 Here are a few things we’ve learned over the years about growing tomatoes that may help gardeners in any climate, particularly one with a short season. Everyone loves those huge, gnarly heirloom tomatoes like Paul Robeson or Mortgage Lifter on display at the farmers' market. They are wonderful, but it can be really difficult to get them to ripen in time to harvest before cold weather sets in. So consider alternatives when you’re planning your next garden. Our grower, Annie Berblinger of Gales Meadow Farms, tries to stick with varietals that mature in 80 days or fewer. Gales Meadow Farms lists many varietals that they've have grown successfully over the years in Washington County, Oregon. Secondly, think about growing smaller tomatoes. In our nearly disastrous season last year, only one tomato succeeded nearly everywhere we planted it: Sun Gold, a lovely little orange-yellow cherry tomato with intense flavor. This year, we’ve planted Sun Gold in almost all of the 32 gardens we manage. It is reliable, productive, and the earliest tomato we harvest. 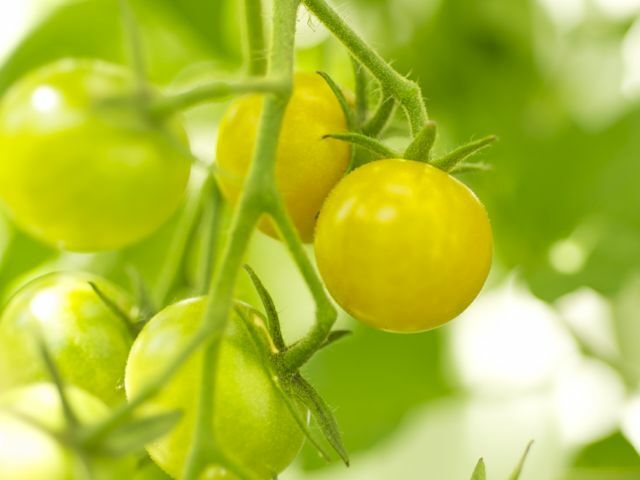 So in planning for your garden next spring, make sure to consider Sun Gold or other cherry or grape tomatoes, or even shorter-season (smaller) heirloom tomatoes as an option. Nearly all heirloom and many other tomatoes are indeterminate (i.e., vining) varietals, requiring trellises, cages, or other vertical supports to grow. Using the right supports not only makes better use of your available garden space, it keeps plants healthier and allows more sunlight and air to reach the fruit. Vertical growing keeps plants up off the ground and away from pests like slugs. And it helps the fruit ripen earlier and more consistently on the vine. There’s a reason those ubiquitous galvanized wire tomato cages are inexpensive. They’re flimsy and, if you think about it, rather poorly designed. 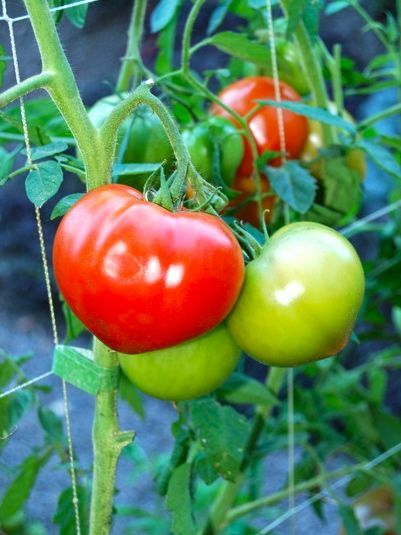 As the season progresses and tomato plants grow tall and heavy, the cages — each a series of connected concentric rings that are smaller in diameter at the bottom — eventually tip over. We far prefer to use either square folding cages, our own copper or galvanized-steel trellises, or Sturdy Cages, made by Oregon Wire Products. Sold under the brand name Cascade Green, these cages are the inverse of the traditional design, with a wider, stable base. They are powder-coated and made of much heavier wire. Ours have lasted for years. Indeterminate tomato plants can get huge in a hurry. They grow tall — often 5 or 6 feet — and send out numerous suckers, which make the plant quite bushy if left unchecked. These suckers are branches that form at the intersection of the main stems and what I’ll call “true” branches. Although the suckers will eventually flower, pruning some of them off throughout the season allows the plant to put its energy into its main branches and fruit, improving the size of the remaining fruit as well as the speed at which it ripens. Pruning also helps shape the plant and encourages vertical growth. 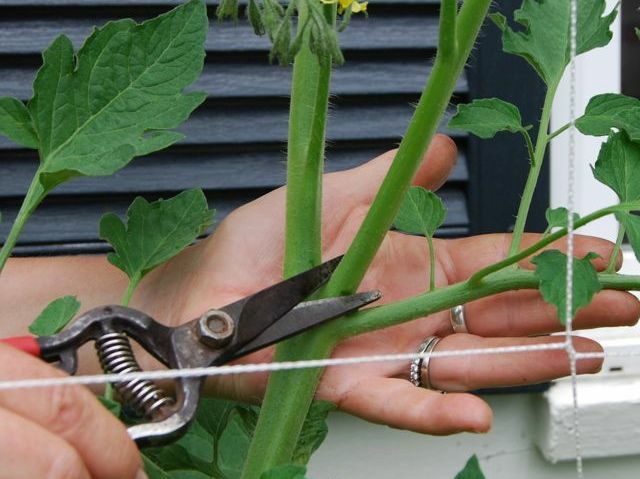 The photo here shows a sucker being pruned off a trellised tomato at the intersection of one of the plant’s main stems and a young branch. We do this early in the season, as we transplant the young plants to their raised beds. We continue to prune off suckers every few weeks throughout the season. We try not to overdo it, though — leaving some suckers means more leaves to provide energy to the ripening fruit. After a few pruning sessions, we focus on pruning only to shape the plants and keep them more or less contained within their cages or their allotted space on the trellis. Are your tomato plants already sprawling out of control? If so, or if you’d just like to see more examples of how and where to prune those suckers, check out this great video we found on the blog Maria’s Farm Country Kitchen. It shows how an experienced gardener tackles an overgrown, sprawling tomato, prunes off suckers, and trains the plant to grow on a simple bamboo support he builds. Seriously. It works! Last August, when we started to panic a little about our many still-green tomatoes, we saw a reader’s tip in an article by Kym Pokorny. A little additional research confirmed her reader’s suggestion that we cut the plant’s roots, so we gave it a try in our own garden. A few weeks later, we did the same in most of our clients’ gardens. Using a pruning saw or other long, sharp implement, we cut straight down into the soil about 6 to 8 inches from the trunk, cutting a semi-circle around one side of the plant. Sounds cruel, perhaps, but it doesn’t hurt the plants at all. It seems to shock them a little, though, apparently letting them know it’s time to ripen the fruit. Within two or three weeks, they do just that. We plan to root-prune this year’s tomatoes in a couple of weeks in each of the gardens we manage. Between that, some judicious pruning of suckers, and a prayer for a continuation of our current glorious summer weather, we’re hoping to beat the odds and produce a healthy crop of ripe tomatoes this season.